The usual 0500 o'clock rise. My wife made a quick 3-in-1 coffee we brought along and I slowly got out of my lethargy. While I was busy gathering the stuff for the day, she brought a cup next door and put it on Steve's terrace. The 7/11 breakfast was quickly pushed down with a chocolate milk and I changed into biking outfit, checking I had my pants on in the correct way. Earlier I had them unaware inversed, looking like a pensioner with pampers. Old age you know! We left again early morning at break of dawn. I said "Arrivederci" to the Italian manager, who was sitting at his computer and meaning "Adieu, to never Wieder Sehen" as I didn't like much his unfriendly behavior of the day before. 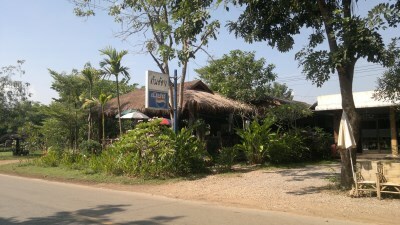 We turned east along road #12 towards Sukhothai. This was a real easy piece of a track as it was hardly more than 60 kilometers, a distance we would cover in about 3 and a half hours with the breaks included. From the new city of Sukhothai the road ran north towards Sawankhalok and the ancient city of Si Satchanalai and Chaliang. I did not exactly know where our destination point of the day was located and we soon found out that it was two kilometers to the south instead of the same distance north. 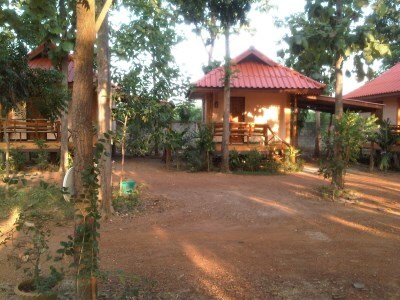 Fortunately the Sakthong Resort was indicated along the road and we found our lodging for the day easily. We took an hour to shower, washed some clothes and prepared the stuff for the next day. There was no food available at the resort and we had to drive a couple of kilometers further to the Ton Ooi Restaurant, close to the entry of the Historical Park and along the track of the next day. 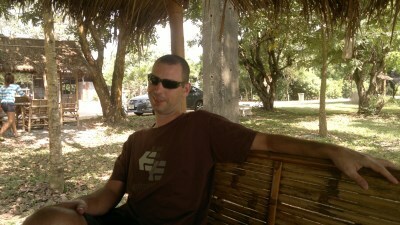 The restaurant had some bamboo shacks with chairs and tables in the shadow opposite the road near a beautiful lake. Service was a bit slow - the poor girls had to run every time across the road - but the food was quite all right. After the meal we returned to the resort. The place had only eight bungalows, equipped with air-conditioning, fridge and satellite television, but the best was it had Wi-Fi. The owners were friendly and helpful. In the afternoon we visited the southwestern area outside the historical park. During the heyday of the Kingdom of Sukhothai, back in the 14th century, Si Satchanalai was a sister city to Sukhothai, second only to the capital in terms of size, political importance and the splendor of its temples. Located on the banks of the Yom River in what is now Tambon Mueang Kao, the remnants of this sprawling metropolis and its laterite walls are still an impressive sight. The fortifications are very interesting as they consist of a triple defense wall with numerous gates and fortresses. Many of the larger temples built with brick and masonry - enclosed within a historical park - have been excavated and restored but of the royal palace, no traces remain. The temples outside the park are situated in lush vegetation and especially the ruins standing on top of a hill range running east to west, continuing across the river makes you feel a bit as Indiana Jones.